Day two of President Putin’s visit to Egypt continued with as much fanfare on Tuesday, as President Abdel-Fattah el-Sissi rolled out more red carpet in Cairo. The pair are expected to discuss boosting trade ties and possibly dumping the US dollar, switching to their national currencies for bilateral trade. One of the biggest deals on the table is a multi-billion euro arms deal. Russia is reportedly seeking to increase sales of arms to Cairo, following the US decision to halt some weapons deliveries to Egypt following the violent crackdown on supporters of former leader Morsi in 2013. The visit is a clear signal of defiance against the US as Russia suffers under Western sanctions over Moscow’s alleged involvement in the crisis in Ukraine. Never one to be outdone in the gift department, Putin offered al-Sisi a Kalashnikov, possibly another unorthodox diplomatic sign that Russia won’t let its foreign policy be dictated by others. Of course, the web had a lot to say about said gift. 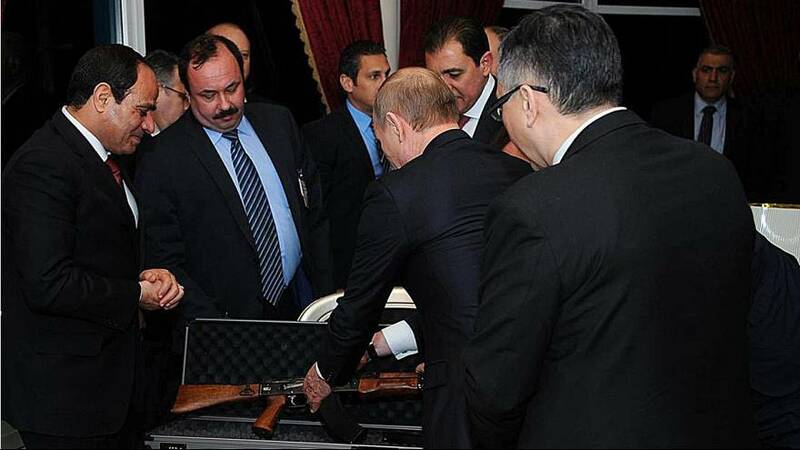 Ahead of Ukraine peace talks tomorrow, Putin presents Egypt's President with a Kalashnikov...? !